I don’t know if this is a good way to start a positive review but a couple of years ago I read Roshani Chokshi’s first book The Star Touched Queen, and I disliked it so much. I thought it was too insta lovey, too lyrical, and the truth is, it didn’t make a lot of sense. I simply thought that maaaybe Roshani’s writing isn’t for me—because I know plenty of people love it. So when A Crown of Wishes came out, I wasn’t so eager to read it. But then the reviews started coming and even the people who dislikes TSTQ, loved it. I’m weak for brilliant reviews, so I gave it a chance and I’m glad I did because this was a lot better than The Star Touched Queen. Let me start by saying that Roshani Chokshi has improved a lot in characterization. While Maya—her protagonist from TSTQ—was lack in personality, Gauri was not. She is fire and sword and sweet things. She’s complicated—strong, and with a heart of gold. I love her character development in the book so much. I also love Vikram aka the fox prince, he’s so charming and fun and smart and God—he’s the perfect match for Gauri. The plot itself was intriguing, but I think I fall in love more with the idea of the plot than the actual execution. It’s lovely and intriguing and I just love the idea of playing to win a wish, but the execution feels just a little… disjointed. Though if you think about it, it could be traced back into two things, the writing and world building. The world building felt a little off for me (emphasize on “a little”). Despite its elaborate description, I couldn’t clearly imagine the settings and all the weird creatures so when things happened involving them, I only like 80% understood. The lyrical writing doesn’t really help, but I admit that it was a lot better than TSTQ. I found the gorgeous proses a lot more readable and I did leaf through the book quickly. Plus I’ve recently been in love with lyrical writing, so. Anyway, deciding on 4 stars rating wasn’t an easy decision—I went back and fourth between 3 and 4 and almost settled with 3.5, but when I got to the ending… I just loved it. I think it was satisfying and wrapped things up nicely, so here are my 4 stars for A Crown of Wishes. Without a doubt, I will add Roshani Chokshi’s next books on my TBR—in fact, I’m thinking of rereading The Star Touched Queen. Welcome to my first actual discussion post in a while 😀 I have to admit, coming up with discussion topics isn’t as easy when you’re currently not reading much, so this one is something I took from my list of post ideas I composed last year. Most of my ideas are no longer relevant, but a few surprisingly still are. As you could guess from the title, today I’ll be talking about translated books and my relationship with them. I love it, hate it, can’t live without it, yet don’t wanna live with it anymore. Sounds confusing? I’ll explain soon 🙈 a little background : I live in Indonesia and my native language is Bahasa. I’ve learned English ever since I was a toddler, but I didn’t start reading books in English until I was a late teenager. Disclaimer : in this post I’ll only be talking about books translated from English to your native language, not from foreign language to English. When I first started reading, I read local books. And comics. I love them, but soon I was running out of things to read, so I started to branch out and read translated books. My first book was Harry Potter (surprised, surprised). I admit, I LOVED translated books. It opened so many doors for me. I mean, if I only read local books, I wouldn’t be the reader I am today. A few years later, I started to get curious and I wanted to read English books in their original language. Funny thing was, there was this cheap books sales selling English books so I thought, this is perfect coincidence! But you know what I bought? I bought… Much Ado About Nothing by Shakespeare… Idk, Shakespeare was a big name and I thought I was gonna start big, but it was freakin classic! I didn’t even like reading classics in my own language, let alone in English one page in and I already leafed through my Oxford dictionary a few times. Long story short, I gave up. It was in 2013 when I eventually read an English book—from end to end. I was following Divergent series and when Allegiant came out, I was so impatient I couldn’t wait for the translated version to come out!! So I bought the original version and surprisingly, I enjoyed it. For sure I didn’t completely understand every words, but I understand enough to get by. It opened even more doors for me, because now I get to read more : books that the translation version haven’t come out and books that didn’t get translated, among others. My English gets better and better each day and it becomes a habit for me to buy and read books in English. I befriend bloggers from all over the world who also read English on daily basis. It’s the new normal. Until I met people in real life who “mock” my choice. I met a few coworkers who also love to read. We’d talk about books we both love and own and when they asked for recommendations, I gave them a few titles I love. When they asked to borrow the books, I told them my copies are in English and if they mind. Aaaaaand they started implying that I’m pretentious or above them by reading in English instead of the translated ones. And they talk about how English books are more expensive and why would I opt for them instead. The comments went on, but the most annoying part is when they resent me for buying books in English because then they can’t borrow the books. I was like??? Excuse me but I buy books for MYSELF, not for you people who can’t even respect my choice. So that’s where this post came from. Like I said, it opened SO MANY doors for me. I wouldn’t be able to read Harry Potter at such a young age if it wasn’t because of the translated version. I get to read books in foreign language. Ruby Red trilogy by Kerstin Gier is one of my favorite series and it was in German. If it wasn’t translated to English, I wouldn’t have read it by now. They’re indeed cheaper. You could buy the translated book for half the price of the original version. The jokes don’t get translated as well. You know how sometimes a joke is in idioms but in the translated version they translate it literally so you lose the point? That happens a lot. I first noticed it when I read Percy Jackson. I felt like the jokes were too stiff and frankly not funny, and when I looked at the original version, I found out why. Sometimes the translated versions are too formal. In Bahasa (or maybe in other languages as well) different context require different speaking style. But a lot of times I found in translated books, the characters speak like they are writing reports—way, wayyy to formal, and highly unusual. I know that writing informally would look messy, but there’s that line between completely formal and completely informal. Local books usually find that balance, but translated books often don’t. They take a long time to release. Sometimes I want to read books right on their release date and waiting for the translated version is agony. Although I admit, nowadays translated books get released a lot faster than it used to. Probably only a month or two later than the original version. A lot of books I want to read don’t even get translated. If you remember my Gemina review, I said that I didn’t enjoy it as much as the first book. I mean, it was mind blowing and all that, but also confusing. A little tad too narrative for my taste and honestly? All the technical sci fi explanation got me all dizzy 😂 I was a little wary Obsidio might disappoint, but it didn’t. Not even for a second. Plot wise, Obsidio successfully delivers the perfect conclusion to the trilogy. After what happened at the end of Gemina, Kady & Ezra and Hanna, Nik, and Ella finally met at the Mao ship and worked through their plan together. There comes the new characters : Asha Grant, Kady’s cousin who’s still in Kerenza along with thousands other survivors and Rhys Lindstorm, her ex-boyfriend who’s now a BeiTech specialist stationed in Kerenza. The dynamic between them is GOLD. It’s almost as good as my darling Kady and Ezra’s. Just as good, dare I say. In this book, we finally got to see the interaction between all the characters. There are a lot of people involved here, but they have one thing in common : they’re all gray characters. They’re good people who do horrible things, and horrible people doing good deeds. Things are never black and white between these characters and just like AIDAN said, everyone is hero in their own story. It’s just a matter of perspectives. This book showed us how the crew of Mao worked on their plan to survive, working side by side (though a million galaxies apart) with the survivors of Kerenza. We’re never explicitly told what the plan was, but it’s shown so clearly through the documents that I was mind blown. It was genius. And the plot twist… SO MANY PLOT TWISTS. There are so many things I didn’t see coming, it was all so unpredictable and I loved it. It kept me at the edge of my seat all the time. In fact, I stayed up until 2 in the morning reading this because it was just that good. Aaaanyway, I have so many more things I want to say about Obsidio, but I realized that all these thoughts and feelings would probably make my reviews confusing and not so helpful, so I might as well stop here. Bottom line is, Obsidio is a fantastic ending to this amazing trilogy and if you ever had any doubt on whether it will disappoint, don’t. It’s gonna blow your mind and sadly break your heart but you wouldn’t mind because it’s just that great. The first half of this month was fasting month and for us Muslim, it’s the month we will always cherish ♥ Eid was also wonderful. Some of my relatives from my mother’s side of family—whom we hadn’t talked to in years—came and we celebrated together. It feels like our family is finally complete again and it’s just so heartwarming to be surrounded by them. Here are the books I read in June. 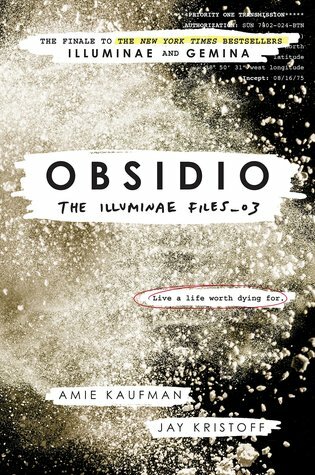 OBSIDIO (5/5). I have so many praises for this book but to sum it all up : Fantastic ending. I love love love this series so much and Obsidio perfectly delivered the ending we all deserved. My review will be published next Wednesday but you can check out my Goodreads review here. STRANGE THE DREAMER (4.5/5). Laini Taylor is a QUEEN because she writes like one. Strange the Dreamer was hauntingly beautiful, monstrous, and simply amazing. I couldn’t stop thinking about the story days after I finished it. Full review here. LEAH AND THE OFF BEAT (4/5). A light and quick read that successfully tackles so many important issues at the same time. I love the writing, the characters and the friendship between them, how it reminds me of high school, and I love all the pop cultures references in it. A CROWN OF WISHES (4/5). I don’t know if you remember but I dislike The Star Touched Queen so much it put me off Roshani Chokshi’s book for a while. I was wary of ACOW but turned out I. Loved. It! ❤ strong characters, lyrical writing, slow burn romance filled with hilarious banter, and MAGIC—what’s not to love? Full review coming soon. While I was away, there are lots of changes happening in the blogging community—one of it is there are so many new and newly discovered (by me) bloggers and I am beyond happy for that!! Here are some of my new discovery. THE INCREDIBLES 2. The movie we’ve been waiting all this time—and it didn’t disappoint! I love the story, the characters, the twist, and the graphic so much. Though there are a lot of intense lighting that could be dangerous for people with photo epilepsy. The Bao short movie at the beginning was also heartwarming ♥ final rating : 9/10. KULARI KE PANTAI. An Indonesian family movie, mostly aimed for children but I LOVED IT. I mean… who am I kidding? I’m still a child 🙈 it’s so simple yet so heartwarming and laced with so many important messages. It also makes me want to go on a road trip. How are you today? I’m currently swamped with work after a long Eid holiday but look at me here, I managed to post again and not relapse into my hiatus 😛 I have a little confession though, finding the time to blog while working full time and not having reliable internet connection is HARD. I admire any of you who’s been doing this all the time and I hope I could keep this up and settle into a comfortable routine soon. Without further ado, let’s get down to the list! Ever since I was younger, I’ve always considered myself a writer. I blog, I write short stories, I attempt writing a novel, and even in my darkest and saddest moment, I poured my feelings through writing. It’s a therapy. But writing doesn’t always come easy, sometimes you know what you want to say but you have a hard time writing them down. Or you just can’t find the right words. Or you’ve done writing but somehow you don’t like what you just wrote. Blogging is a good practice—a really good one. Through blogging I get used to translating my thoughts and feelings into words and in the process I expand my vocabulary, I discover my preferable writing style, and most importantly, I find my voice. Losing my blogging friends is one of my biggest fear from getting back into blogging. A year is a plenty of time for things to happen on the internet, what if they forget about me? If I’ve dropped by your blog, you may have noticed that sometimes I started my comment with “do you remember me”. It’s more than just ice breaker because because I’m honestly scared to just barge in your post being all excited and enthusiastic and there you are thinking, do I remember this person? also I noticed that there has been a lot of changes : people who were active before no longer are and there are lots of new bloggers. Still related to my point before, I realized I’ve fallen so out of the loop with the book community 😦 during my first few months of hiatus, I still tried to maintain communication with my blogging friends through twitter. But then I started running out things to talk about—mostly because I no longer read. And soon I just… stopped. I stopped sharing stories and I don’t know, I guess I got too wrapped up in my routine. But I still followed you all, you know. I never unfollowed anyone, so I watched the interaction between my blogging friends. I saw what they’re talking about, but I felt irrelevant. I don’t read the books they’re hyping, I don’t know those new authors they’re talking about, and there are a lot of new bloggers I just didn’t know. Remember the time when I read like 3 books per week and regularly post reviews of them? Yeah, me neither. It seems like a long time ago I have to admit : I love reading from when I was a kid, but blogging about the books I read actually motivate me to keep reading. When I was blogging, I always want to read the latest releases because of the hype—and frankly to ramble about them on my own blog. Strange the Dreamer, much like its title, is strange indeed. Strange, beautiful, exquisite, lovely, and heartbreaking. Exactly what I expected from Laini Taylor. If you know how much I love Daughter of Smoke and Bone trilogy (A LOT), you’ll be surprised of how long it took for me to finish this book. I started this not long after its publication date, but then I got bored because it was slow and I was busy and impatient. So I stopped reading at the end of Part I and only picked it up a few days ago—or weeks, by the time this review went up. And boy did I regret not picking it up sooner because I. LOVED. IT. It’s without doubt THE MOST beautiful thing I’ve ever read. Laini Taylor always has her way with words, and it’s straight to my heart because I’m falling in love with her writing all over again. It’s lyrical, poetic, gorgeous. It’s like lullaby to my eyes but instead of lulling me to sleep, it keeps me awake at nights (see my attempt at extravagant description here? :P) along with its gorgeous writing was its slow pace—which I’m almost sure always go hand in hand. The story build up slowly, full of lush description of people and places and feelings. And feelings, most definitely, because I’m sure I got my heart ripped out all over again. So many feelings of love, hate, despair, hope, and revenge. Sarai and Lazlo instantly became my favorite characters. Lazlo with his hope, naivety, and dreams. He’s just so pure I can’t stand horrible things happening to him </3 and Sarai, with her empathy and conflicting feelings that I relate so much on personal level. I know how she feels to stand between two opposite sides and want to try to bridge the difference but gets it all wrong instead. She’s my precious little monster. I love the star-crossed lover dynamic between Lazlo and Sarai so much, but even I have to admit that it was pretty insta-lovey. The other characters also have so much depths. I love how Laini Taylor explored their feelings and the reasons why they did what they did. It makes things gray instead of black and white, and I love it. Sparrow, Ruby, Minya, Feral, Azareen, Eril-Fane, Suheyla, they all have their places in my heart. Have I mentioned that it was MONSTROUS?? I mean, it”s in the title of the post but I feel like all I’ve been saying was how BEAUTIFUL it is but it’s also full of blue monsters and it miiiiight remind you of Avatar but this one is so much more gorgeous. Also, brutal and tragic, especially the ENDING I can’t even with that ending </3 though I’m glad we’re only 4 months away from Muse of Nightmares so I don’t have to wait that long.